The Hollywood String Quartet, formed in 1939 and active until 1961, is regarded as the first American-born chamber music group to rise to international prominence. Their fame was due, in large part, to their numerous and exceptional recordings. The members were all studio musicians who created the lush, glowing soundtracks of Hollywood’s “golden age.” First violinist Felix Slatkin, concertmaster of the 20th Century Fox Orchestra, and his wife Eleanor Aller, principal cellist of the Warner Brothers Orchestra, were joined by second violinist Paul Shure, and violist Paul Robyn. After 1955, Robyn was replaced by Alvin Dinkin. 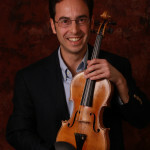 Violinist Joseph Stepansky replaced Shure for some later concert tours. …we made room for each other technically and soloistically-but the blend of sound was the main thing…you draw the sound by your ability; the kind of vibrato you use, the way you apply pressure to the bow…these are all very subtle techniques in string playing…Dynamics were a very big part of our work. Our discussions were always about dynamics and a little bit about tempi, and nothing else. We played with vibrato except where there was a particular effect to be had-no dead left hands were allowed. I think when musicians get together, many times the question of `backgrounds’ never comes up, and you have disparate kinds of chamber music institutions: people from a French school mixed with someone from a Russian school mixed with someone from a German school.” “With the Hollywood String Quartet, you had four people who basically had the same kind of training, four people who were more or less of the same age group and who approached music in almost identical ways. The manner in which they played and practiced individually was quite different. My father, for instance, hardly ever practiced. He could just pick up a violin after three or four weeks off (if he had such a thing), and produce an extraordinary Tchaikovsky concerto. My mother always resented that he didn’t have to work so hard; she had to practice like a dog, about four or five hours a day. In this 1955 studio recording, you can get a sense of the Hollywood Quartet’s virtuosity and concept of blend. The four instruments often seem to speak as one voice. The second movement is a series of variations on Schubert’s haunting song, Death and the Maiden. Pianist Victor Aller joined the Hollywood Quartet for this recording. I offered a few thoughts on this piece in this previous post. The string sextet Verklärte Nacht (Transfigured Night) is one of Arnold Schoenberg’s earliest compositions. Its five movements are inspired by a poem by Richard Dehmel in which a man and woman walk through a dark forest on a moonlit night. In the surreal scene, the woman’s dark confession that she bears the child of another man is met with the man’s acceptance and forgiveness. This remains one of the definitive recordings of this work. The liner notes for the 1950 album state, “This recording was prepared under the personal supervision of the composer.” There are fascinating echoes of late Mahler and Strauss throughout this piece. My parents would talk to Frank very often about their own technique…He asked them questions. `What is that when you take the bow and you just kind of move it up and play several notes at a time? How do you do that?’ he’d ask. He was fascinated by this, and my parents would say, `But Frank, we want to be able to imitate your voice!’ I think that was a part of Sinatra’s relationship with his musicians: there was a give-and-take, and everyone was interested in how each other produced what they did. Sinatra was always asking for advice to improve his singing, and they were always asking for advice on how to improve their phrasing vis-a-vis being more vocal in the way they played.